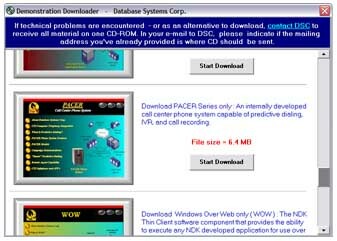 Click the screen shot below to install our Demonstration Downloader. This program will allow you secure access to download any or all of the latest presentations we have to offer. If technical problems are encountered during this download, contact DSC to receive all materials on one CD-ROM (Sorry, domestic shipments only). In your e-mail to DSC, please indicate the mailing address where the CD should is to be sent. Once you have downloaded this program, you will have the option to install one or all of the three presentations. After a download process is complete, an icon will appear on your desk top along with the product presentation name. Double click this icon to install on your PC. The presentation is subsequently placed in a directory named "Database Systems Product Presentations". If other presentations have been downloaded, they too will appear in this same directory. To view any of the presentations appearing in this directory, simply choose the appropriate product presentation file name. To uninstall any presentation and its documentation, simply double click the product icon and answer "yes" when requested to confirm uninstall.